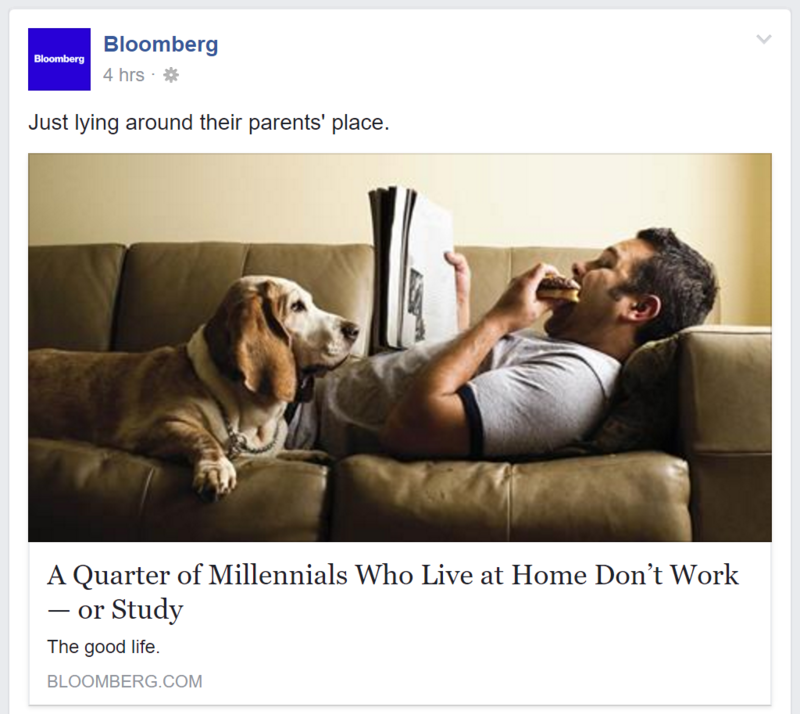 Today, Bloomberg continued riding on the anti-millennial bandwagon and published a new post entitled “A Quarter of Millennials Who Live at Home Don’t Work – Or Study.” I want you to stop and look at everything in this Facebook post. They’re using a stock photo to convey a sense of laziness: look at this lazy, entitled Millennial lying on his parents’ couch eating while they’re slaving away at work. But let’s table all of that and focus on Bloomberg’s post about lazy, entitled millennials just lazing about and leeching off their parents. For the past several years, we’ve seen a growing trend of media outlets opting for sensationalized headlines that drive clicks, shares, and comments, rather than ones that seek to genuinely inform their audience. As people are becoming increasingly likely to read only the headline, rather than the full article, it’s important that headlines be explicit and accurate. 1/3rd of Americans aged 18 to 34 live at home. This includes college dormitories. 1/4th of Americans aged 25 to 34 that live at home are neither enrolled in school nor working. Well, it didn’t take long to debunk Bloomberg’s headline. Let me make a few points: First, if someone is living in a college dormitory then they must must be enrolled in school and they are not living at home. Even if 100% of dorm residents were to return home for the summer, it’s still misleading to label them as living with their parents and, of course, any claim that they aren’t enrolled in school is patently untrue. The second claim regarding Americans aged 25 to 34 can’t be the basis of the headline either, since the “25 to 34” age bracket doesn’t fully encompass the millennial generation. But it looks like the second claim is the basis of Bloomberg’s headline. They write, “Among 25- to 34-year-olds living at home, one in four is neither enrolled in school nor working. That’s 2.2 million people, a small percentage of the nation’s more than 70 million millennials but a striking figure nonetheless.” As I mentioned above, that’s not a quarter of all millennials who are living at home, that’s a quarter of a particular subset of millennials who are living at home. And when Bloomberg says “a small percentage” they really mean a small percentage because 2,200,000 / 70,000,000 = 0.03 or 3% (but that’s much less exciting than what they shared in their headline). Maybe there’s something else going on here. I decided to go directly to the Census Bureau’s report and run the numbers myself. Of Americans aged 18 to 24 (28,010,698), 56% (15,795,266) are living at home. Of those living at home, 10.1% (1,595,322) are unemployed. Of Americans aged 25 to 34 (42,861,420), 19.5% (8,381,719) are living at home. Of those living at home, 10.2% (854,935) are unemployed. Let’s put it all together: Of Americans aged 18 to 34 (70,872,118), 34% (24,176,985) are living at home. Of those living at home, 10% (2,450,257) are unemployed. In other words: 1 in 10 Americans aged 18 to 34 who are living at home are also unemployed (not 1 in 4). So where does the 1 in 4 figure come from? I’d like to thank the U.S. Census Bureau for redefining “young people.” I’d also like to thank Bloomberg for sensationalizing Census data to push an anti-millennial agenda and for including people with disabilities in a group they depicted as lazy, entitled leeches. You make me wanna study hard and expand my knowledge of the world and leave a strong impactful legacy on Earth. I’m a stranger who discovered about you last year when I read your facebook comment about whether a baby should be taken out of life support or not. The passion with which you speak about some topics really impresses me; no wonder you’re in MENSA. Nevertheless, I’d like to request you to keep writing such insightful articles and to always keep making a positive constructive difference.